In this post, we’ll move further east, and look at Québec’s other major accent groups, before moving into the remaining provinces. As far as accents, this is a transition zone between Québec City and the Gaspésie region. There are not many variations from Québec City, although you may find some words are pronounced differently, for example, some people will say “peelouse” rather than “pelouse” for grass/lawn. 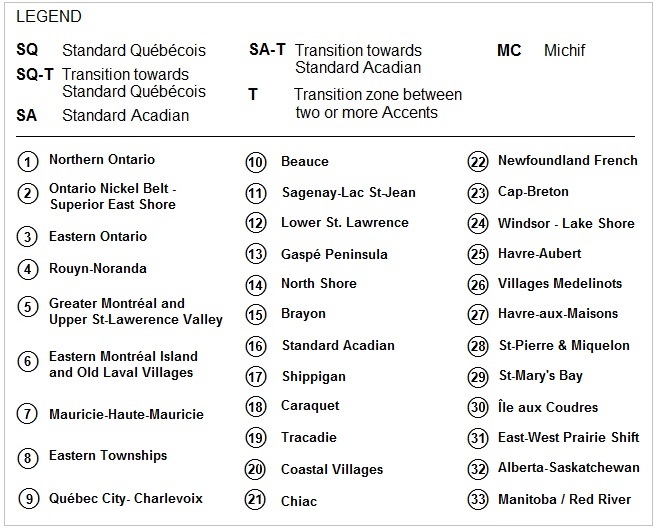 Because the accent transitions are spotty, it’s difficult to describe exactly what the Lower St. Lawrence accent is. Two major population centres are in this region: Rivière-du-loup and Rimouski. You’ll note that these two ladies’ accents are exactly the same. See if you can relate the second video to the first video, and you’ll begin to see a generational difference in accents (the phenomenon I spoke about in the first post, in which regional accents are starting to standardize with great speed between generations). When people in Québec think about their various accents, four main accents come to mind: Montréal, Québec City, Lac-St-Jean, and Gaspésie. Gaspésie’s accent is history of mixing of Acadian and interior Québec accents within a span of 250 years. It’s therefore somewhat of a hybrid accent, where you can hear traces of both Acadia and Québec. This next video is interesting… in it you will hear Standard Québecois and you’ll be able to compare it to the Gaspésie accent. It’s an interview with the Mayor of the village of Grosse-Roches (she speaks with a Gaspésie accent). The interviewer speaks with a Standard Québecois accent (the video also includes other people speaking with a Gaspésie accent). Côte-Nord’s accent starts around the town of Tadoussac where it is almost the same as the Saguenay – Lac-St-Jean’s accent. The further you move East along the shore, the heavier the accent becomes. I drove from Alberta to Baie Comeau (on the North Shore) many years ago to see a friend who was transferred there from Edmonton (and then I drove another 90 minutes past Baie Comeau – 4,900 kms or more than 3000 miles of driving… 51 hours of driving each way. Not sure I’d do such a long drive again, but the fishing along the North Coast was amazing!). Even that far along the road, I didn’t notice a major accent difference between the accent in Baie Comeau and that of Saguenay’s – however a stronger accent was starting to come through here and there. The above video comes from the archives of Radio-Canada, and was filmed almost as far East on the North Shore highway as you can drive without having to take a ferry to go further (a town directly north of Île Anticosti).. You’ll hear similar “a” and “o” sounds as those from Acadia, but with a more celtic-style twang (much of the North Shore was populated by people from the Magdalen Islands, and also Acadians — thus the similarities in the vowels). Sometimes a “g” will be dropped and be replaced by an “h”, which results in worlds melding to a point that they can be difficult to discern individually if you’re not used to the accent, or if the accent becomes too strong. Here’s another video, in which the first speaker has an accent from the Baie Comeau / Sept-Îles region (where the former Prime Minister Brian Mulroney is from – however Mulroney’s accent was 100% Standard Québec). The second speaker in this same video has a relatively Standard Québecois accent. The third speaker has a touch of a local accent in his voice (you’ll notice it in his higher-toned vowels). These next few Québec accents are oddities and very unique, in the sense that they exist only on tiny islands. Different villages on the same islands will even have their own unique accents. The Magdalen Islands form an archipelago quite far out in the Gulf of St. Lawrence, off the coasts of Prince Edward Island and Cape Breton. Here, each village seems to have its own accent. Most villages are Francophone, but a couple villages are Anglophone. The accent is a mix of old Québécois words and tones (many which don’t exist on the mainland anymore), Basque sounds (from fishermen from Spain who fished the coast hundreds of years ago), Acadian accents (who moved here during the deportation in the 1700s), and Anglo-Celtic influences. The Magdalen Islands sometimes have the most difficult-to-understand accents. 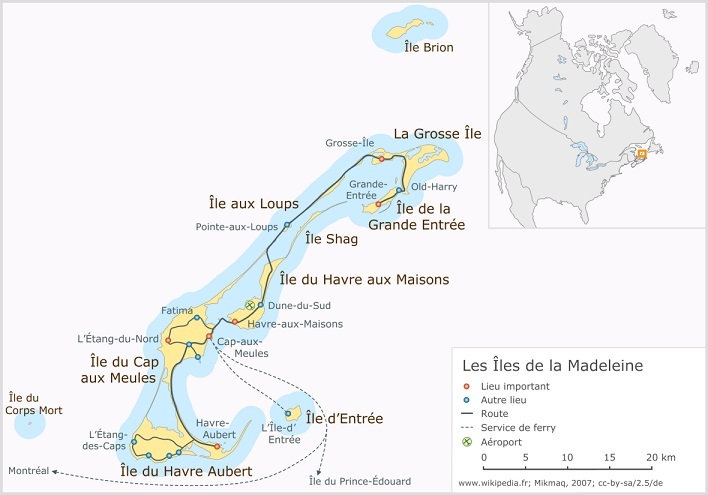 Above – A map of the Magdalene Islands (Îles-de-la-Madeleine) which has several different accents in such a small territory. Creative Commons Credit Klaus Mueller. This is a village on the Magdalen Islands, known for having one of the Island’s more distinct accents. This is another village on the Magdalen Islands, also known for having one of the archipelago’s more unique accents. That has wrapped up our look at the major accent groups of Québec. The next post will look at the French accent groups of Acadia and Atlantic Canada. By Quebec Culture Blog 101 in Uncategorized on November 16, 2014 .